Each class in C# resides in a separate physical file with a .cs extension. C# provides the ability to have a single class implementation in multiple .cs files using the partial modifier keyword. 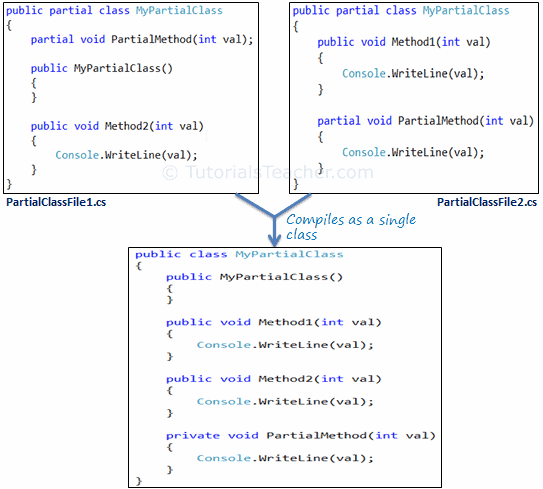 The partial modifier can be applied to a class, method, interface or structure. All the partial class definitions must be in the same assembly and namespace. All the parts must have the same accessibility like public or private, etc. If any part is declared abstract, sealed or base type then the whole class is declared of the same type. Different parts can have different base types and so the final class will inherit all the base types. The Partial modifier can only appear immediately before the keywords class, struct, or interface. Nested partial types are allowed. Multiple developers can work simultaneously with a single class in separate files. When working with automatically generated source, code can be added to the class without having to recreate the source file. For example, Visual Studio separates HTML code for the UI and server side code into two separate files: .aspx and .cs files. PartialClassFile1.cs contains the declaration of the partial method and PartialClassFile2.cs contains the implementation of the partial method. The partial method declaration must began with the partial modifier. The partial method can have a ref but not an out parameter. Partial methods are implicitly private methods. Partial methods can be static methods. Partial methods can be generic. Use the partial keyword to split interface, class, method or structure into multiple .cs files. The partial method must be declared before implementation. All the partial class, method , interface or structs must have the same access modifiers.